For more than two hundred years the Royal Institution has been at the centre of scientific research and has also provided a cultural location for science in Britain. Within its walls some of the major scientific figures of the last two centuries - such as Humphry Davy, Michael Faraday, John Tyndall, James Dewar, Lord Rayleigh, William Henry Bragg, Henry Dale, Eric Rideal, William Lawrence Bragg and George Porter - carried out much of their research. Their discoveries include sodium, the miners' lamp, the electric dynamo, transformer and generator, the 'thermos' flask, x-ray crystallography and much else besides, all of which brought about major changes in the way we live. The success of the Royal Institution in research and in locating science within general culture led it being used as a model for other institutions, most notably by the founders of the Smithsonian Institution in Washington. 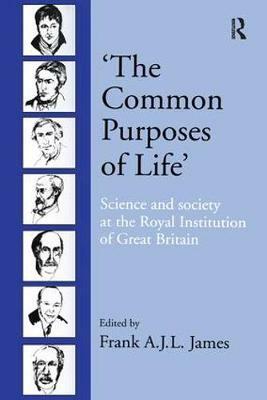 Much has been written about the scientific work in the Royal Institution, but comparatively little attention has been devoted to the cultural settings which allowed the Royal Institution to become such a major site for the creation of scientific knowledge. This book seeks to rectify this gap by examining various aspects of its history through both thematic and chronological chapters.